During WWII, the VW Type 166 Schwimmwagen was introduced as a replacement vehicle for the motorcycle-sidecar combination being used by reconnaissance units at that time. The introduction of a four wheel drive system heralded a vehicle with not only a much improved cross country ability, but better weather protection for the crew as well. With the harsh terrain encountered on the Russian Front, an amphibious vehicle would clearly be advantageous. 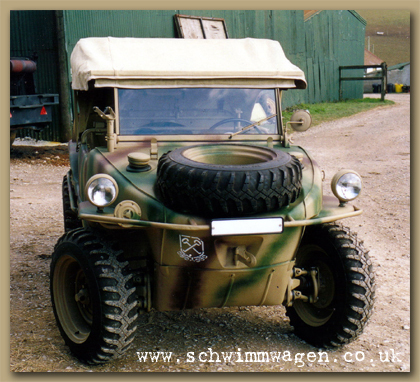 The Type 166 Schwimmwagen was initially planned as a reconnaissance vehicle. The design was a popular success, its simple mechanics and transmission along with its light weight allowing for difficult terrain to be traversed with ease and reliability. The outstanding amphibious capabilities were much appreciated by the units issued with the vehicle. Stowed on the side of the vehicle are the shovel and paddle. The paddle is carried in case of an engine failure while in the water; when the vehicle enters the water a member of the crew lowers the propeller with a purpose -designed rod. The propeller does not have to be secured whilst the vehicle is travelling in the water, as the pressure of the water keeps it pressed against the clutch coupling. Because of the direct link between the propeller and the drive shaft, propeller speed can only be regulated by use of the gas pedal and the propeller turned only in one direction (only forward travel was possible). The propeller has to be lowered to gain access to the engine compartment. The engine has a capacity of 1,130 cm3 and produces 25 h.p. Power is transmitted to the wheels by a transmission which, in addition to the usual four forward gears and reverse gear, has a special lever which can be shifted into a supplementary high-ratio gear for cross-country travel, as well as being used to engage front-wheel drive. Production started at the VW factory located in Fallersleben, northern Germany in July 1942. The monocoque body was supplied by Ambi-Budd in Berlin, the same supplier as for the VW Kubelwagen body. A little over 14,000 Type 166 vehicles were produced up until the production line closed in Nov 1944 - however, it is believed that an additional 1,100 vehicles were completed after that period, taking the total to just over 15,000. The Schwimmwagen shown here and according to the records of the AutoMuseum Volkswagen, was built on the 29th March 1944 and issued to the Heereszeugamt Kassel on the 31st March 1944. Roughly 95% of all Schwimmwagen’s would have been issued to the Army placement depot at Kassel which was the nearest vehicle collection point to Fallersleben that dealt with softskin vehicles. From there the vehicles were kitted out and sent to their various units. It is believed that somewhere in the region of 500 Schwimmwagen’s are still in existence today, mainly in private collections and museums around the world. According to one of the previous owners, he purchased the vehicle in 1982 from a French farmer who claims to have recovered the vehicle from the side of the road in the Dinard region of Brittany in 1944.